The Mexican enigma: In a world burdened by conformity, Tinker Juarez is a refreshing example of the individual who plays the game for himself while maintaining a sense of humor and concern for others. 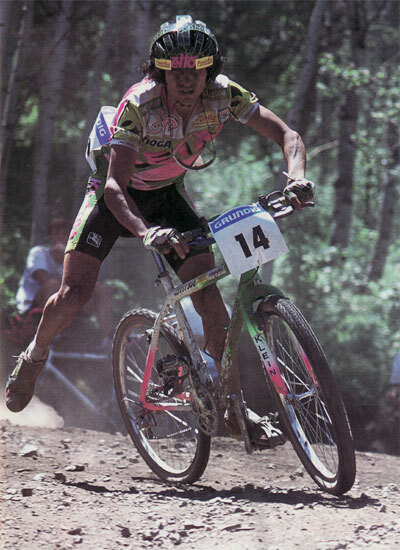 Tinker is probably the only rider on the circuit capable of winning the major races who, for some reason or another, hasn´t. Many predict that the win will come soon. When Crosby, Stills and Nash sang Almost Cut My Hair to the Woodstock Nation, it was an invitation for the thousands of young citizens listening to break the bonds of conformity and let their freak flag fly. Though the wicked echo of Jimi Hendrix´s Stratocaster guitar as it blared its unique version of The Star Spangled Banner over the emptying fields of ol´ man Yasger´s upstate New York farm is but a memory, the call for nonconformity remains as important as ever. individualism has no doubt been a contributing factor in gaining the strong following among race fans that he has enjoyed over the years. To them it is obvious that, though the fastest mountain bike pro of Mexican descent approaches the sport differently, he is still sincere and true to the cause of which we are all enamored—racing! 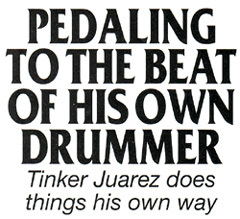 More than any other measure, the one that Tinker is most often sized up by is his ability to suffer and endure. The harder the challenge, the more enthused Tinker is to overcome it—it takes an awful lot to keep him from finishing a race. At last year´s NORBA National in Durango, Tinker lost his seat on the first lap and continued racing. When he passed one spectator gallery, an obviously impressed fan yelled out, "You´re incredible, Tinker." As Tinker pedaled on, chasing down the next competitor, he yelled back, "No pain, no gain!" Tinker´s ability to turn big gears when others are gearing down is another feat he is famous for. This season marks Tinker´s third year with Klein Bicycles and Campagnolo as his main Sponsors. Before he headed off to Europe for the opening round of the Grundig World Cup series, we decided to sit down to find out what makes him tick. MBA: What´s your history with bicycle racing? Ragged edge: While Tinker´s ability to grind up hills in the big ring earns him the most admiration, it´s his lightning–quick handling skills, learned from years as a BMX pro, that complete the package and keep him in the front ranks of the sport. Park City, Utah. XXL Tinker Juarez in Park City. bikes I borrowed from MBA. Since I had been racing in the Pro class since I was 15 years old, I figured that´s where I´d start with mountain bikes. If I couldn´t keep up with the guys after all my years racing, then I didn´t belong out there at all ! General Bicycles heard I was racing and sponsored me before the year was out. MBA: How did you make the transition, and are there comparisons between the two ? Tinker: It was a lot of fun, but it was a hard sport as far as training went. I just concentrated on putting miles on in the hills to build up my endurance. There´s really no comparison between the two at all. BMX racing requires a different kind of concentration, but it did give me confidence when it came time to line up with the Pro mountain bikers. MBA: There probably isn´t another rider on the circuit who has as many stories milling around about him as you do. What do you think about what everyone says about your hair, training methods and ability to stay in the big chainring when no one eise can ? other racers. I´m a Mexican and I have long hair, but mountain bike racing isn´t about how you look, it´s how you perform. Look at Kenny Souza. He looks different than everybody else, but he´s only there to do his best, and he has succeeded. Everyone thought that Tomac looked cool with long hair, but now there´s a trend to cut it. I´ll put my hair in a ponytail for my sponsors, but I don´t want to be pressured into cutting it off just because no one else likes it. I have a better attitude with my hair long and I lose confidence with it short. I do push a big ring more often, but it´s because I run a narrow rear tire that I can. This way you can go with the pain a little bit more before you have to shift down. I train with a big tire and a big gear. On what are normally middle–chainring climbs, I´ll use my big ring. The idea is to make my training rides as hard as the race is for everyone else. I´ll also weight my bike down as much as possible. By the time I get to a race my bike will feel much lighter and faster. MBA: What about your pain threshold ? Some people think you don´t have one. I would´ve quit racing a long time ago. The only time I start to lose confidence is when I´m not training. Bornout for me comes when I haven´t trained enough. MBA: Do you use a road bike to train much ? Tinker: I could slide in the past without having to use one, but now the competition is forcing me to change my training methods. MBA: What about suspension ? Last year you were the only top–placing Pro rider to not use any. Tinker: I´m using Rock Shox now. Last year I trained with suspension, but I wasn´t used to it enough to want to put any on my race bike. On some courses it was definitely a disadvantage, but I had to make the best of it and use my body for suspension and not try to use a lack of it as an excuse for not doing well. MBA: We have noticed by the crowd response to you at races, even in Europe, that you are one of the most popular racers around. What do you attribute that to ? Tinker: I never turn anyone down when they want to talk to me—I won´t walk away before they do. I consider myself lucky to be where I´m at, so I think it´s good to spend time with people who would want to be in my position.